Can run Grim Fandango from hard drive (play without the cd’s) and can automatically copy the required files to the hard drive. 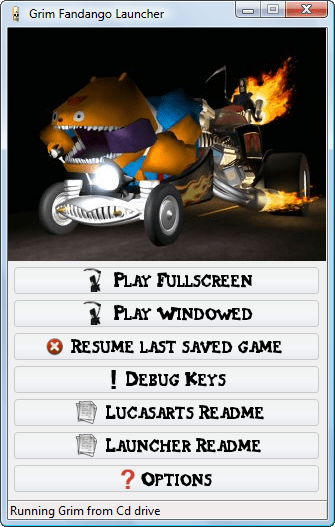 Can run Grim Fandango in windowed mode. Automatically enables Grim Fandango’s developer/debug mode. (The good_times registry key). Provides a synopsis of debug features and debug keys. Can download and install the official Grim Fandango patch if its not applied. Works on both 32 bit and 64 bit versions of Windows and has been tested on XP, Vista, Windows 7 and Windows 8. Windows 98, ME and 2000 are not officially supported but should work correctly.